Canoe Polo is an exciting paddling discipline which combines paddling and ball skills in a fast moving team game. The game is played on a marked pitch either indoors or outdoors with five players plus up to 3 subs on each side. The object of the game is to score in the opposition’s goal, the ball can only be held for 5 seconds and any player in possession of the ball can be pushed over. Viking Kayak Club compete under the name VKC. We have teams playing in each class of the sport, including open (mixed gender teams), youth & women’s leagues. We have had players selected for the GB U21 development squad and Ireland U21 squad in recent years, and we have recently secured the services of a world class coach. As well as competing in national and regional leagues (see below), VKC attend summer international tournaments around the UK & Europe. VKC Polo – playful polo – welcoming, safe, supportive and fun. Stable core of social players plus a steady stream of new blood maintaining the ‘youth flow’ through the polo section, all actively contributing to the smooth running of the club. Both social polo and regular structured coaching throughout the year. Range of teams spanning National Div 1 to Regional Div 4, and including the Youth and Women’s Leagues – providing continuity and progression for those who want to go beyond social polo. Sufficient well-maintained equipment to support the full range of new players (e.g. large through to small), and the youth stream – including sufficient club boats and BAs to cater for multiple teams playing simultaneously. Magic flying goals that automatically hover in the correct place when we are playing/training on the river with no put up or take down required. Whether you’re an experienced player looking for a new club, or a complete beginner wanting to try canoe polo for the first time, you’ll find us extremely friendly and inclusive – so please do get in touch! We provide all the equipment a new player needs to get started as well as support and encouragement. 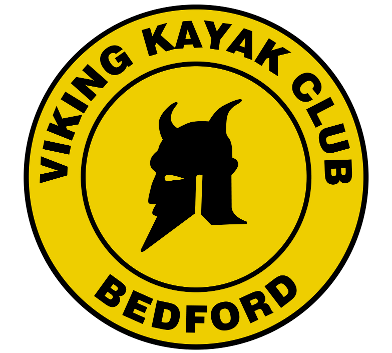 If you would like to get involved with this exciting sport or have any questions please contact PeterT via polo@vikingkayak.co.uk or come along to the club on a Wednesday evening during May to September. Apply to join the VKC Polo Facebook group – this is the main way in which we communicate with each other. Where are VKC playing during the season? We train on the river during the warmer months (May to September) and at Robinson Pool in the colder months (Late September to April). Additional pool sessions are often run over the winter to develop player’s ability to roll. Most of our training and tournaments involves mixed gender teams. We have players spanning a wide range of ages (currently from about 9 years old up to around 60). VKC field at least two teams in the BCU National Open Leagues. This caters for players of a range of levels of competence (beyond the novice level). We enter at least one team in the National Youth League, and at least one team in the National Women’s league. In 2018 we were the only club in the country to have a Women’s Youth squad. We also enter a range of teams in the Regional Open Leagues. These leagues cater for the full range of players from novices through to ‘experts’. When the Bedford River Festival is on (even numbered years) we run a polo tournament as part of the festival. Times given are ‘on the water’ – arrive earlier to get changed and kitted up. Saturdays 10.00 to 12.00 – training at which everyone is welcome – NOTE that these sessions are often cancelled if there are tournaments (or other competing events) so check the VKC Polo Facebook group to see if the session is on. There is a charge for attending pool sessions – currently £5 per person per session at Robinson Pool for club members. Tuesdays 21.00 to 22.00 General pool session at Robinson Pool. This is NOT a dedicated polo session but is great for practicing rolling, ball skills, etc.. Open to all. Collect kit from the clubhouse at 20.15. Wednesdays 21.00 to 22.00 Polo training at Robinson Pool for competent players. Saturdays 10.00 to 12.00 Polo training on the river – for competent paddlers (you need to be confident that you are not going to capsize!) – NOTE that these sessions are often cancelled if there are tournaments (or other competing events) so check the VKC Polo Facebook group to see if the session is on. These Saturday morning sessions can be on or off until the last minute; dependent on late nights on Friday, nights out planned on Saturday or weather.